Simplicity of use: thanks to both an ergonomic design and the dedicated market leading Calisto software, LABSYS evo is user friendly and intuitive to operate – LABSYS evo offers a “Plug & play” gas analyzer coupling device,enabling simultaneous MS, FTIR or GC/MS connections. - Incomparable precision: the unique 3D DSC sensor totally surrounds your sample and reference crucibles so that the entire energy of any transformation is monitored thereby giving you an unequalled accuracy of measurement. - sweeping gas (inert, oxidizing, reducing, wet, pressure) and flow rate. – Excellent TG signal baseline: the symmetry of the microbalance, with its sample and reference suspended vertically from the beam guarantee reproducible positioning of the sample over time and excellent stability of the TG signal baseline. – Automatic compensation of Buoyancy: the sample and the reference are heated inside the same calorimetric block (symmetrical furnace), which means that the buoyancy effect is automatically compensated. Ease of operation: dedicated market leading CALISTO software that is not only intuitive but powerful enough to perform every typical experiments and data treatment. This solution consists of silica tubing connected to a turbomolecular pump via a computer controlled solenoid valve. The vacuum level is measured by a Pirani gauge and acquired by the software. Aluminum crucibles are available with pierced lids to work in TG-DSC mode, along with silica or inconel tubing options, allowing heat of evaporation measurement. The crucible volume is 90 µL, diameter 4mm and height 11.3mm. A cost effective SENSYS evo TGA was designed without the standard DSC function. Operation remains between -120 and 830°C. Crucibles 120 μl, 160 μl, 320 μl – aluminium, incoloy, gold plated incoloy, graphite,alumina, platinum, etc. CRUCIBLES Crucibles of 150 μl capacity are available in aluminium, alumina, platinum or silica to suit the chemical nature of the sample. A silica tube can be added to protect the transducer and the analysis chambers during test involving sweeping with corrosive gas. 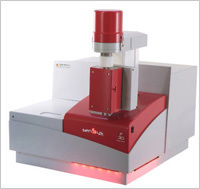 Evolved Gas Analysis The SENSYS evo design features both a small furnace volume and also an easily accessible exhaust to allow for direct connection to further analysis devices such as MS, FTIR, GC etc. without excessive sample dilution or long transfer lines. Setaram offers a range of transfer lines and software solution for system comprehensive integration. To date SENSYS has also been successfully coupled with: – FTIR/MS and GC, – Gas Sorption devices, – An X-ray absorption spectroscopy apparatus. Measurements under controlled humidity Humidity is known to have a significant influence on the stability of many materials. In order to evaluate this specific influence, SETARAM has developed WETSYS a controlled humidity generator. It can: – deliver a very precise level of relative humidity (RH) from 5 to 95 % depending on the temperature and measure the humidity around the sample. 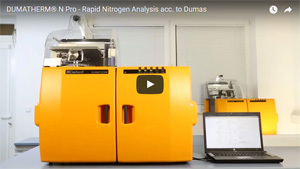 – be connected to SETARAM instruments, and in particular to the SENSYS evo TG-DSC as well as other analysis instrument(RX, GC, etc.) for studies of sorption, hydration, stability, etc. Applications With its high precision and wide temperature range (-120 to 830 °C) the SENSYS evo TG-DSC has a wide range of applications, especially in the fields of thermodynamics (Specific Heat Capacity Cp precision within +/-1 %), pharmaceuticals (phase diagram, polymorphism, purity, thermal stability), safety of chemical process (transition, decomposition under high pressure), energy (catalysis, hydrogen storage, hydrogen adsorption),polymers (glass transition, measurement under pressure), etc. View the application notes in your field, available for download, by visiting Application Library area We have also included a powerful search engine that will enable you to find the most applicable data.